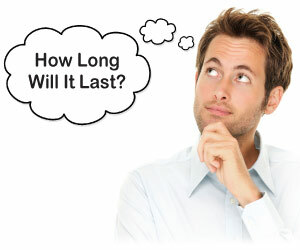 Root Canal Treatment - How Long Will It Last? My dentist told me that I need to have a root canal treatment in a tooth, but how long will my tooth last if I do it? Thanks for this important question. Today, root canal treatment, also known as endodontic treatment (“endo” – inside; “odont” – tooth), will save your natural tooth and allow you to keep it functional for decades if not a lifetime. But just as no two people are the same, teeth also vary widely, so that the success of root canal treatment depends on many factors. Before we explore some of the most important ones, let’s talk about what root canal treatment is, and why you need it. Root canal treatment is usually undertaken by a general dentist or an endodontist — a dental specialist who has two to three additional years of advanced training in the diagnosis and treatment of dental pain, and related root canal disorders and diseases. Although general dentists have some education and training in root canal therapy, they often send cases to their endodontic partners for treatment. These include the more complicated, difficult cases or those beyond their comfort level. Treatment: A recent evidence-based study of teeth having a primary (first time) root canal treatment cited conditions that contributed to the success and longevity of root canal fillings. One was the absence of root canal infection that had spread into the bone — in other words, the earlier the tooth is treated the better the outcome. So don’t put off treatment if you need it! Another was the quality of the root canal treatment itself. How quickly and effectively the damaged tooth was repaired after root canal treatment was completed was also a factor, meaning it’s important to have the tooth restored with a permanent filling or crown, which usually requires a second office visit, without delay. All Teeth Are Not Created Equal: Very basically the front teeth, which are used for cutting, have single roots (and canals) and are both easier to access and treat. They also receive less biting force than the back teeth. The back teeth, which by contrast are used for chewing, have two or three roots and therefore more root canals; they are more difficult to access and are more complicated to treat. 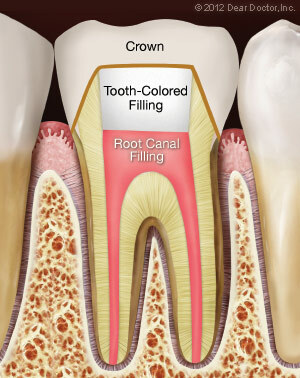 In addition, a front tooth may not need a crown after root canal treatment but a back tooth will. Changes Over Time: Studies have shown that there is a significant correlation between age and how resistant a tooth is to fracture, whether or not it has had root canal treatment. Over time, teeth can become more brittle and have a greater tendency to fracture, especially the back molar teeth that receive the most biting force. That’s why it’s important to place crowns on root canal treated teeth to cover and protect them from undue stress, which will increase their longevity. Sometimes it is also necessary to place a post inside a treated root canal to support and reinforce a crown, especially if the tooth has been extensively damaged. However, certain posts, although sometimes necessary, may increase the possibility of root fractures over time.